Juan Del Toro, doctoral candidate in NYU's Steinhardt School of Culture, Education, and Human Development finds that Black and Latino adolescent boys who are stopped by police report more frequent engagement in delinquent behavior thereafter. "Our findings indicate that the single most common proactive policing strategy – directing officers to make contact with individual boys and young men in 'high crime' areas – may impose a terrible cost on Black and Latino youth across the country," said Juan Del Toro, doctoral candidate in NYU Steinhardt's Department of Applied Psychology. "Police stops are associated with harmful outcomes including subsequent delinquent behavior and psychological distress that may be even more harmful when they occur earlier in boys' lives. These consequences warrant urgent attention from social scientists and policymakers." This research was published in Proceedings of the National Academy of Sciences (PNAS). Police agencies across the country have sought out to reduce crimes by shifting to what is known as "proactive policing" – proactively deploying officers to places where crime is likely to be reported and to engage with people most likely to be accused of those crimes. A recent review of research demonstrates that proactive policing is associated with reduced crime, however, the same research also acknowledges that proactive policing can negatively affect the public legitimacy of law enforcement and even push people to avoid law-related officials altogether. The research also ignores the potentially negative effects of proactive policing on racial disparities or youth criminality. The new research by Del Toro addresses the research gap by studying and finding that police stops increase the likelihood that Black and Latino adolescents' will engage in subsequent delinquent behavior. Boys, and nonwhite boys in particular, were the focus of Del Toro's research because they are far more likely to experience police stops, arrests, or other contact with law enforcement compared to their peers. Del Toro points to New York City notes that in 2016, more than 90 percent of people subjected to police stops were male – out of those 52 percent Black, 29 percent Latino, 10 percent White. Forty-seven percent were juveniles aged 14-24. Of the juveniles who experienced police encounters, only 7.2 percent were female and 7.5 percent were White. I pretty much discount any 'studies' done in the soft sciences and any 'studies' done that have any political implications. In the past couple of decades science has been overrun with activists who masquerade as scientists who value their politics far more than science. Since Americans are so deeply ignorant, they did not hear about Fredrick Nietzsche or for that matter, the whole of philosophy. They are the country of doing, not thinking. In the context of their proud anti intellectualism, they do not know Nietzsche's insight that question the authority of society to judge the misbehavior of their citizens. So Americans enjoy producing environments and conditions that increase the chances of crime, so that they can JUDGE and PUNISH the offender. Whereas in Europe, most countries understood that society creates criminals, and therefore it is illogical to punish them. In Europe, the strategy to reduce crime has been to fight poverty, to educate people, to promote equality, to reduce the number of laws and encarceration policies. However, it seems that all the suffering of the world would not teach Americans, they seem locked from within their heads. to quote Tolstoy; "Nietzche was stupid and abnormal." Oh yes, filling prisons with people, separating families, selling weapons to every dumb idiot, that is the American genious. Police stops increase the perception of TRIBE and aggravate the tribal dynamic: internal altruism in conjunction with external animosity and aggression. Which increases the frequency and severity of police encounters. Etcetcetc. This has ALL been fueled and exploited by the left and the media of late for political purposes. If people were educated about tribalism, this would be one less tool available to dishonest and unscrupulous politicians... which is precisely WHY it is not taught in schools or discussed in the media. The left is facing extinction. They are always a minority in a functional democracy. Periodically they have no choice but to attempt to destroy it by any and all means. -The committed tribalist has the DUTY to victimize competing tribes. It is a matter of honor and pride. Police have falsely, for the most part, been portrayed as representatives of the prevailing tribe which automatically makes them the enemy. Police are also tribal, and are susceptible to the same sorts of pressures to victimize in defense of their tribe. But they are trained to consider everybody as fellow tribesmen first. Tribal behaviors automatically elicit a tribal response in all of us. Police are just as susceptible to this as anybody else. Police are treated like a gang for youth in cities. The more often you are targetted unfairly by them, the more likely you are to engage in activities that they wouldn't approve of. We are supposed to be free to do what we want unless a specific reason has been given to believe we committed a crime. Instead, the crime of rights violations are whitewashed and claimed to be proactive policing, instead of targetting minorities and ensuring they will hate every police officer and everything they stand for from that point on. Walking while brown is the worst crime a police officer can spot, and the result is a spiral of crime. If we stopped and searched off duty officers as often as they stop children without cause, we would quickly find proactive policing a crime. are you describing your own argument? 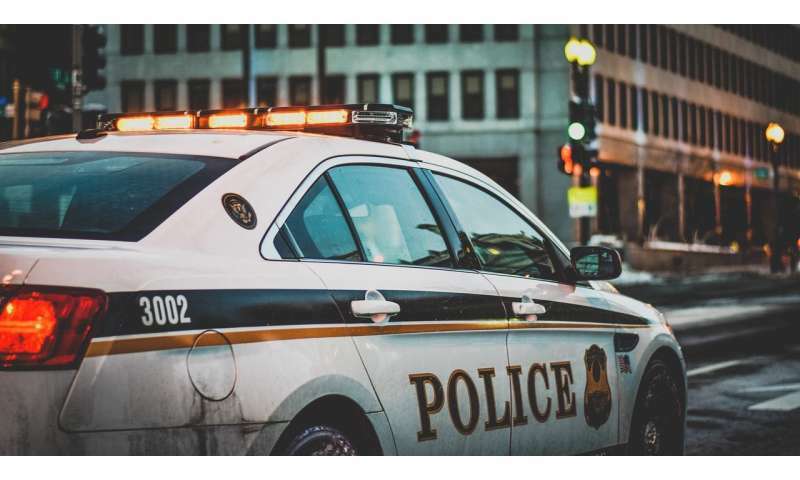 "New research by NYU Steinhardt doctoral candidate Juan Del Toro finds that black and Latino adolescent boys who are stopped by police report more frequent engagement in delinquent behavior thereafter." He found correlation. Do these "scientists" care about proving causation anymore? When you know who is most likely going to commit or has committed a crime, you don't allocate your resources in areas where crime barely exists. Look at Chicago, the north has crime like a Nordic country. The south is a shooting gallery. Guess who lives in the north, and who in the south? When you know who is most likely going to commit or has committed a crime, you don't allocate your resources in areas where crime barely exists. The issue is that you have to look before you know, but then you're already allocating your resources to police there. If you only police where you know there is crime, it's a self-fulfilling policy because you will not know there is crime where you don't police. Anywhere you put the police snooping around you'll find more crime than "usual" simply because most crime goes unreported. That is already true before this study, and now with the indication that proactive policing increases criminal behavior, that's strike two. But this is just John Gall's insight all over: the system is actively creating the problems it was built to solve. The system, like the police force, measures its own success according to things like "criminals caught", so they automatically slip into modes of operation which increase crime. -So you're saying most crimes are only discovered by police? That doesnt make sense. "The 1994 National Crime Victimization Survey found that only 36% of crimes against individuals are reported to police. Broken down by type of crime, 42% of violent victimizations and 34% of all property crimes were reported." "The data revealed that 83.2 percent of injury-causing crimes went unreported to police in one Atlanta jurisdiction, and 93.1 percent in another"
-This data was gleaned from emergency rooms. It says that unreported crimes are much higher per capita in high crime areas, just like reported ones. IOW a cops time is better spent in high crime areas. Also IOW people are more apt to report crimes in low crime areas which has a lot to do with WHY they are low crime areas. Another significant factor is the increase in armed citizens. "the CRS report shows that more guns–especially more concealable guns–has actually correlated with less crime." Yes, but cops aren't omniscient. Reality to the system is what is reported to the system, so to identify where the high crime areas are, you have to put policemen out there. Wherever you put the policemen then becomes "high crime area" because they identify the crime that previously they didn't know about. The emphasis is on "they didn't know about", because what the people know is different from what the police know, and what individual policemen know is different from what the police organization's administration knows. John Gall calls this the "coefficient of fiction", which means the amount of reality that fails to reach the controlling element of the system or organization. It spans form 0 to 1 meaning total ignorance of facts, but in some systems, particularly in religions and governments it can exceed 1. So you're saying most crimes are only discovered by police? That doesnt make sense. No, I'm saying the police is not aware of most of the crimes that are happening. As you pointed out, people in low-crime areas are more likely to report it, and in high crime areas more crimes go unreported, so the distinction between "low" and "high" crime area is largely a matter of how many policemen you put out there. Proactive policing helps the police discover crime, but using that information to steer where they should police is just going to be a feedback loop that automatically points towards discriminating the poor and the minorities and ignoring the rest of the crime elsewhere. If this then causes animosity and increased criminal behavior, that's a double jeopardy. The question is, should the police catch more criminals, or protect everyone equally? Youre missing the deterrent factor of police presence. And again youre implying that only cops find crime and not citizens. Low crime areas are due in large part to citizens taking active measures to deter, prevent, and report crimes when they occur. As it should be. ??? Obviously, people need more protecting in high crime areas... because theres more crime, you know? Its like youre focussed on the rights of criminals and not victims or something.